Printed on high quality glossy photographic paper, your favorite memories are sure to stand out on your custom printed greetings, invitations and announcements. Add a personalized touch to any photo card for any occasion, using our online card maker. The steps are fast and simple and you can easily send out your custom printed cards as soon as they’re delivered to your door! If you’re looking for card stock cards, check out our double sided photo cards and folding greeting cards for even more designs and customized options! Need cheap graduation invitations? Look no further than Photobucket Print Shop! Our glossy cards are printed on high quality photo paper to bring out the best in your photos! You can select from multiple card templates and fill them up with pictures from your phone, Facebook, or your laptop. Most of our customers prefer senior portraits or photographic favorites from their grad’s high school years. No matter your needs, Print Shop makes custom greeting card printing simple and fun! For Mother’s Day this year, create a one-of-a-kind greeting for Mom that’s tailored to her liking. Print Shop has a wide variety of card designs that you can personalized with her favorite photos. 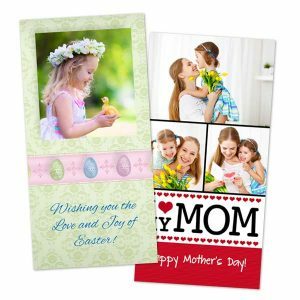 Instead of searching endlessly for the perfect card at your local card shop, you can create Mothers Day cards with pictures in minutes using our convenient online greeting card maker! Whether you’re giving it to her in person or sending it to her across the country, your personalized greeting is sure to make her smile! Our glossy photo cards are perfect for not only Mother’s Day, but Father’s Day too! Browse our selection of Father’s Day greeting cards, and embellish your favorite template with pictures saved to your phone, Facebook, or laptop. We make the process of designing your own greeting simple. When you’ve finished picking out photos for Dad, you can place them on your layout and add a personal message to wish him all the best on his big day! Already have his card picked out? We offer multiple Father’s Day photo gifts! Gather your photos, get creative, and make something just for him that comes from the heart! 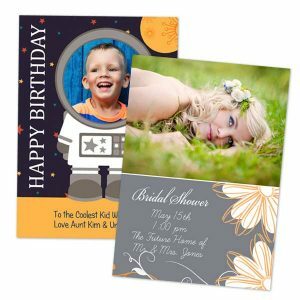 Create unique photo invitations for birthdays, weddings, graduation parties, and more with Photobucket Print Shop glossy photo paper cards. Store-bought invitations just don’t have the heartwarming feel as a custom created photo card. Embellish your invitations with a favorite snapshot, personalized text, or your own uploaded artwork. Each photo card style that we offer includes complimentary envelopes so you can send them out to your guests as soon as they arrive. From modern to traditional, we have a custom photo invitation card that’s perfect for any celebration! There are celebrations, milestones, and moments throughout the year that deserve recognition. From holidays and anniversaries, to job promotions and housewarmings, you can create the perfect custom printed photo card for any occasion. Design your own Happy Halloween cards to send out to friends and family, or create Valentine’s Day greeting cards with a favorite photo to give to your significant other. Not just for holidays, you can create your own photo personalized cards for everyday greetings so you can periodically send out a thoughtful little note to keep in touch with loved ones throughout the year! Upload photos from Photobucket, your phone, or Facebook to get started. Then, choose a template and let your photos take center stage for the perfect personalized greeting.